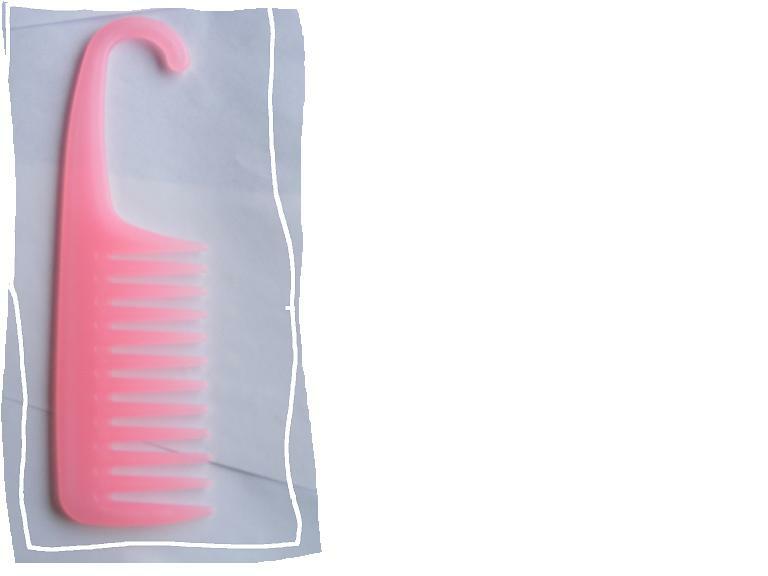 This comb is hooked on the shower rack in my….guess it…..SHOWER, YES!!! I have long, fine hair. I can’t imagine trying to comb my hair without combing it first, with conditioner still in it, before rinsing. If not, I’d end up with a tangled mess and a handful of broken hair. This pink one I got last year when I went to the coast for a weekend. I forgot to bring my original one. And, as I mentioned, I couldn’t go without one. Hey, that’s what makes Walgreens so damn handy! …teeth on the other. But, seriously, before I rinse out my conditioner, I use this comb because it is super gentle on my fragile, wet strands. And the comb, itself is easy to care for. To wash it, I put it in a bowl of water with a couple of capfuls of bleach and let it stand for a couple of hours. After wiping and rinsing, back into the shower ready for my next wash. I know it is so simple, but, really I LOVE this tool! It could easily be the only tool I would need for my hair. And because I know you want to know, my original one is white and I have had it for at least a decade. Since I had to get a second one, I went for pink. This entry was posted in comb, shower comb, Tool Tuesday by kimberlyp. Bookmark the permalink.